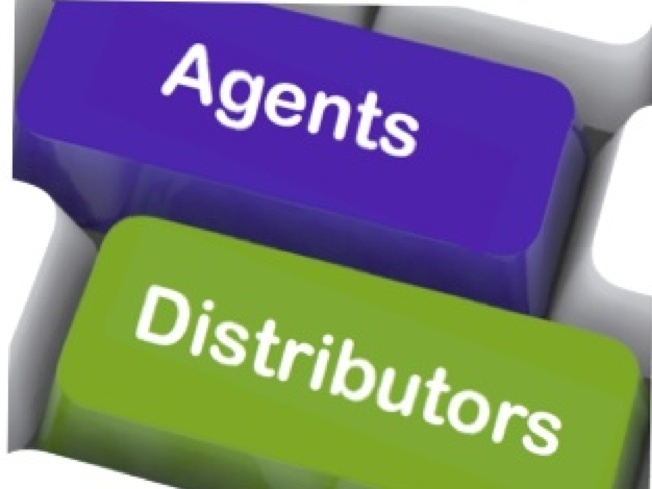 Digital control valves are multi stage set-stop valve. 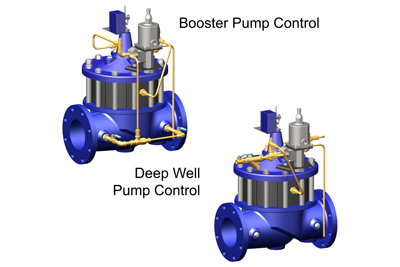 Digital Control valves is an electrically actuated, hydraulically operated multi-function control valve. Models:- DA 1110 (Globe Y-Pattern), DA 110 (Globe Straight Pattern), DA 110-ACT (Anti-Cavitation Trim) for high pressure differential & low flows. Application:- These are used for control of clean liquids, set-stop. Gas Terminals, Ship loading & Unloading. Used extensively in loading terminal automation systems in refineries, storage tanks used for accurate & effective filling of tankers & wagons. Construction:- Has 2 solenoid valves, receiving signal from batch controllers to position the valve for low flow/medium flow/high flow conditions as required & programmed. Material of Construction:- Carbon Steel, Alloy Steel, Stainless Steel, Nickel, Monel, Bronze other material as required. Size:- 2”, 3”. 4” & 6”. Pressure Class:- ANSI 150# & 300#. 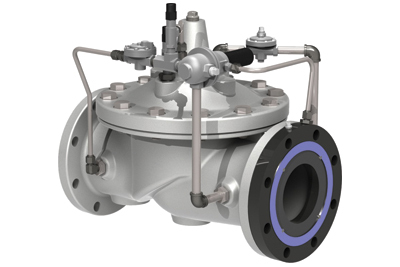 DEVaaM make deluge valves are hydraulically actuated pilot operated diaphragm control valve. Available in 2 basic design DA 210 Straight pattern & DA 2100 Angle pattern, all internal parts like cover are 100% same in both the designs. These valves are Mfg. with Dry Trim (Pneumatic Actuated) & Wet Trim (Hydraulic Actuated). Both options are available with Electrical Trim solenoid Actuated Model DA 210-B All trims are factory piped on the Valve itself. It also has Manual Station as Test Trim, Manual Override and Drain Line. 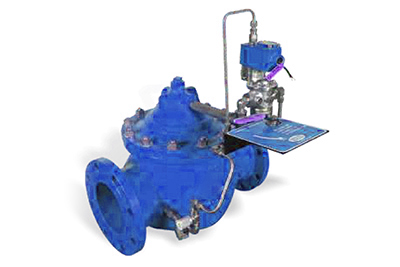 The valve opens on demand to provide water flow to the fire protection sprinkler system. Pilot system can be hydraulically, pneumatically or manually operated. 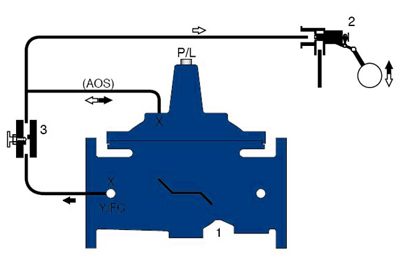 Opening of the Valve is by electrical signal to solenoid valve/loss of control pressure. DEVaaM special Diaphragm & Quad seal ring for zero leakage. Valve size upto 8” will open in just 2 seconds. Models:- DA 210 (Globe Straight) (2” – 30”), DA 2100 (Angle Pattern) (2” – 8”) Flanged as per ANSI B16.5. Size:- 50 NB – 750 NB. Ratings:- 150#, Max 285 Psig(20 Barg), 300#, Max 375 Psig(26 Barg). Materials:- Cast Carbon Steel, Naval bronze, Nickel Al.-Bronze, Stainless Steel, Monel etc.. Optional Features:- Pneumatic Trim, Water motor alarm – Gong, Pressure Switch, Test Trim, Ex-Proof enclosure for hazardous areas, Electric release trim, Skid mounted with Isolation valves, Siamese connection, Local control panel. 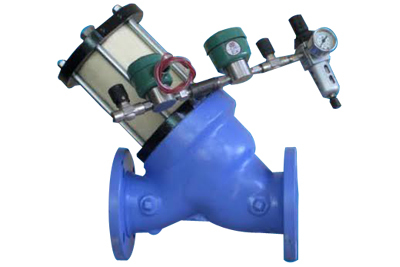 Filter Separator control valve with Float pilot. The valve is installed on Filter Separator along with complete Float Operated Control System to monitor and control the water level in the Separator. In the event, water level rises above certain level, the Slug Control Valve (Fueling Valve) will close automatically and Water Drain Valve will open allowing the Water to Drain. Once the water level drops to safe level the Fueling Valve opens allowing the Fueling to start and Drain Valve closes. Entire system is foolproof for Aircraft Fueling. Size: – 25 NB – 750 NB. Pressure Class: – ANSI 150# & 300#. Materials: – Carbon Steel, Alloy Steel, Stainless Steel etc. Automatically reduces a higher inlet pressure to a constant lower outlet pressure. 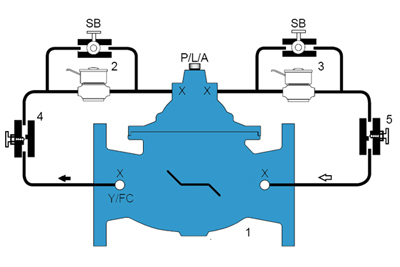 The valve consists of a main valve and (Fig. 55) pressure reducing control pilot. Slight changes in downstream pressure acts on topside of control diaphragm causing main Valve to counteract pressure changes and hold a constant outlet pressure. The regulator will reduce the upstream pressure to a constant downstream pressure regardless of the change in flow rates/or inlet pressure. The pilot is a Normally Open valve that senses the downstream pressure. Models: – DA 355 (Globe), DA 3550 (Angle). Spring Range: – Standard: 20-175 Psig, Optional: 5-35 Psig. Non return function, closes automatically in case of reversal flow. 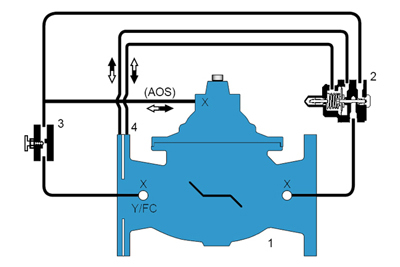 The valve allows flow when inlet pressure is higher than outlet pressure. 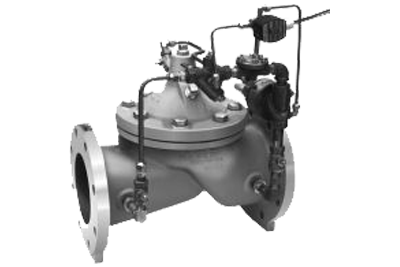 In case of reverse flow, the valve closes within appropriate time to ensure it does not generate any surge / water hammer. Ideal for Air craft fuelling application. Valve opens and closes at controlled (adjustable) speed to ensure smooth flow. Operated by two way – three way solenoid pilot valve, a Solenoid Control Valve is an on-off control valve that either open or closes upon receiving an electrical signals to the solenoid pilot control, provides two position [ On-Off ] Operation. 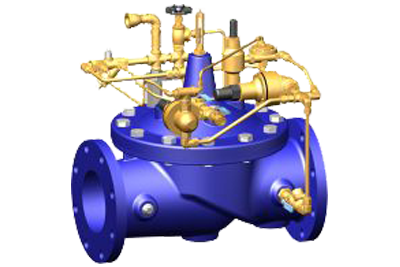 The main valve opens fully or closes drip tight depending upon the actuation position of the solenoid, energized to open/energized to close. 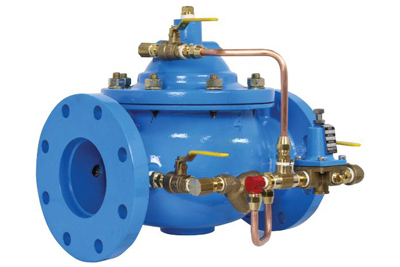 The valve may be remotely operated by timers, relays, probes or any triggered device to the solenoid. Additional Features: – Electronic Flow control & metering system (Dual Solenoid). Auto Re-circulation on a Refueller to control the pumping pressure of Air Crafts. Solenoid Override or Pneumatic Override to safeguard the system. This can be operated remotely to re-circulate full flow. When installed in Main line, it prevents upstream pressure dropping below preset value. When installed on a By-Pass line, it controls main line pressure by relieving excess pressure in By-Pass/sump. Ideal for pump by pass to protect the downstream equipments. Relief pilot (F22) is normally closed due to spring tension. With increase in upstream pressure above set value, Pilot (F-22) opens which makes Main Valve to open fully. Models: – DA 422 (Globe), DA 4220 (Angle). Surge anticipating relief on rise of pressure valve. Function:- The pilot senses the differential pressure across the specially sized thin edge orifice plate mounted in the valve inlet flange. when the pressure differential is less than the set point, the main valve opens and allowing to maintain the desired flow. At the desired max. set point the pilot valve reacts to small changes in sensing pressure and controls the main valve position by modulating the pressure above the diaphragm. The pump starts against the close valve, when the pump is started, the solenoid control is energized and the valve begins to open slowly, gradually increase the line pressure to full opening head. 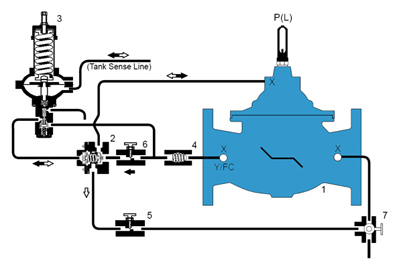 when the pump is signaled to shut off the solenoid control is de-energized and the valve begins to close slowly, gradually reducing flow, while the pump continues to run. The model DA 8110, Modulating float control valve to maintain constant liquid level in storage tanks and reservoirs by compensating for variations in supply or demand, keeping the tank full. 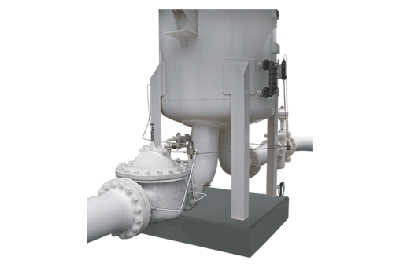 Function: – One way Altitude valve controls the high water level in elevated Tanks or reservoirs. The altitude pilot senses the hydrostatic head of the reservoir to close on high water level. When the water level drops below the predetermined set point the valve opens to fill the reservoir. Supply pressure is greater than static head pressure. Tank discharge is by separate line. Operation: – This is a hydraulically operated and pilot controlled valve which operates on the differential in forces between a spring load and the water level in the reservoir. The desired high water level is set by adjusting the spring force. The pilot control measures the head through a sensing line directly connected to the reservoir. Valve Controllers:- The DEVaaM controllers are designed to enable remote control of electronic valves in water plant or distribution systems. These controllers can also serve as an interface between a SCADA system & other devices installed on or around the valve like DEVaaM make e-Flow Meter. Power Generators:- The Intermediate Power Generator is a self-contained power generation system to be mounted on a DEVaaM Automatic control valve. Advantages: – Uses hydraulic energy of the system to generate power. This is ideal for isolated locations & confined spaces. Flow Meters: – The DEVaaM Flow Meter is a vortex shedding insertion electronic floe meter designed to fit into DEVaaM Automatic Control valve to provide accurate flow measurement data without the need to install a separate inline meter. Electronic Pilot Controls: – DEVaaM Electronic pilot controls are ideal ways to add the capability for remote electronic operation of DEVaaM make Automatic Control valves. These pilots are available in variety of configurations. DEVaaM make pilot control provides accurate & reliable Pressure reducing, Pressure Relief, Pressure sustaining & advanced pressure management functionality. Valve Position Transmitter: – DEVaaM make valve position Indicator are the simplest means of determining valve position. The DEVaaM valve position transmitter communicates through an industry standard 4-20mA output delivering the accuracy required for computer-guided control valve systems (SCADA). Electronic Product Display: – The DEVaaM make e-Display displays rate upto five digits & total up to eight digits. The e-Display can be programmed to automatically or manually toggle between rate & totalizing functions. Standard features include an optional backlit display with Bar graph, on-screen custom engineering unit, Minimum/Maximum display, alarm & pulse outputs. Designed to be wall mounted this is easy to set-up & is most suitable for installation with DEVaaM make e-FlowMeter.